Posted on March 15, 2019 at 1:56 pm. Our medical interpreter training program, Bridging the Gap, is one of the leading programs of its kind in the U.S. today. Through our fully licensed program, we prepare bilingual individuals to work as professional medical interpreters in both hospital and clinical settings. Course environments are active, and students learn through participatory training techniques, including role-playing, group discussions and practicing medical interpreting. A medical interpreter’s cultural competency is a crucial aspect of communication in any healthcare setting. Because of this, our course places special emphasis on the nuances of specific cultures, raising the sensitivity and awareness of our students. Click here to register directly through HelloSign. Bridging the Gap is the top training program for medical interpreters in the US. The goal is to provide medical interpreter training for bilingual people to work as interpreters in clinics and hospitals. 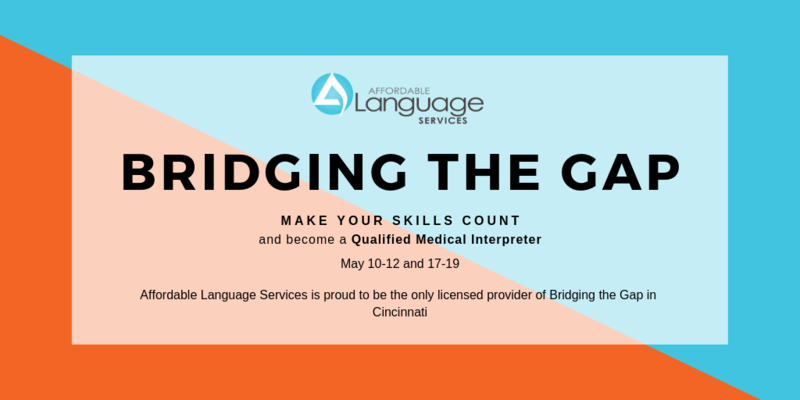 Don’t forget: Bridging the Gap is one of the stepping stones to becoming a certified medical interpreter!